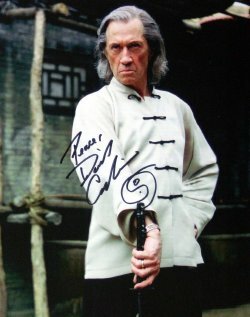 David Carradine (birth name John Arthur Carradine) was born in 1936 in Hollywood, California. He is the eldest son of character actor John Carradine. His half-brothers Keith Carradine and Robert Carradine are also prominent actors. 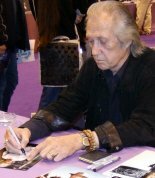 David Carradine studied music theory and composition at San Fransisco State College, where he wrote music for the college drama revues and, at the same time, developed his interest in acting, particularly Shakespeare. After two years in the army, Carradine appeared in several Broadway productions, before returning to Hollywood for the TV series Shane (1966). He had a number of minor parts in TV productions, but his first notable film role was in Martin Scorsese's film Boxcar Bertha (1972). 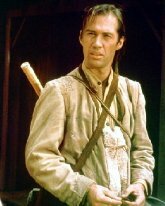 After 1975, with Kung Fu behind him, Carradine pursued a film career that includes nearly 180 film and TV dramas, as well as stage work. A look at his IMDb filmography will show the range of his work. Some of it is low-grade and forgettable, but there have been some films nominated for awards. 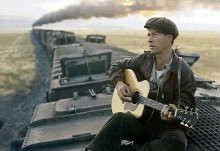 Bound For Glory (1976) won Carradine 'Best Actor' award and a Golden Globe nomination for his portrayal of Woodie Guthrie, one of America's greatest folk singers. He won a second Golden Globe nomination for his role of Justin La Motte in North and South (1985). Other films that brought critical acclaim for Carradine include The Long Riders (1980), Americana (1983) which Carradine directed, and Bird on a Wire (1990). Carradine was much praised for his impressive performance in both Kill Bill films, and much work has followed since for this veteran actor. Shakespeare's Richard III, in which he plays Buckingham, is just one of the twelve films that Carradine has made in 2007! 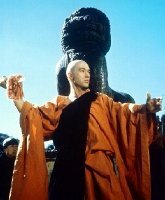 David Carradine's lifelong fascination with Eastern philosophy led him to write the book Spirit of Shaolin in 1991. This was followed by Tai Chi Workout in 1995 and Introduction to Chi Kung in 1997. Kill Bill: Vol. 1 is the first half of what was originally intended to be one very long film lasting over three hours. Kill Bill: Vol. 2 came out six months later. 1972 proved to be an important year for Carradine, with the start of the iconic TV series Kung Fu. The 62 episodes, made between 1972 and 1975, turned him into a superstar. His character was a renegade Chinese Shaolin priest called Kwai Chang Caine, and he captured the hearts of Americans during the 1970s with his gentle, non-violent manner. Caine roamed 19th Century America in search of his elder brother and, at the same time, helping those in need. Carradine was chosen ahead of Bruce Lee for the part of Caine. Carradine's life story, from the wayward, drug-taking 'hippie', of his youth, to successful actor, is told in his 650 page autobiography Endless Highway, published in 1995. Carradine lived with his 5th wife, Annie, in Los Angeles until his death in a Bangkok hotel room on 4th June 2009. He usually adds a or 'yin-yang' symbol (called a Taijitu) when he signs his autographs. 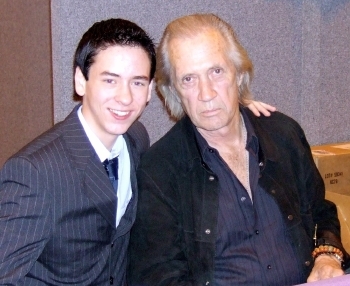 I met David Carradine at the NEC in Birmingham in November 2006. He signed a photograph for me and also a copy of his book The Kill Bill Diary. I had my photo taken with him but he doesn't look too happy about it, does he?! David Carradine has his own page on MySpace where you can hear him as a singer (see link).